Chiropractor East Stroudsburg: Ten Back-Friendly Activities The Whole Family Will Love! If your kids aren’t out of school for summer break yet, they will be soon. What does summer look like in your home? Is it bike rides, hikes, and trips to the lake? Or is it video games, tablets, and cell phones? There’s no right or wrong way to spend your summer, but making sure that you and the kids stay active is important and will help to keep everyone healthy. If you’re one of the many patients who stop in to see us for back pain at Marshall Creek Wellness Solutions, don’t worry. Many people think that back pain means a summer of laying in bed (or by the pool). But movement and exercise are actually some of the best ways to prevent back pain from getting worse! So get out there with your family, soak up the sun, and stay active! Here Are Ten Summer Activities The Whole Family Will Enjoy! 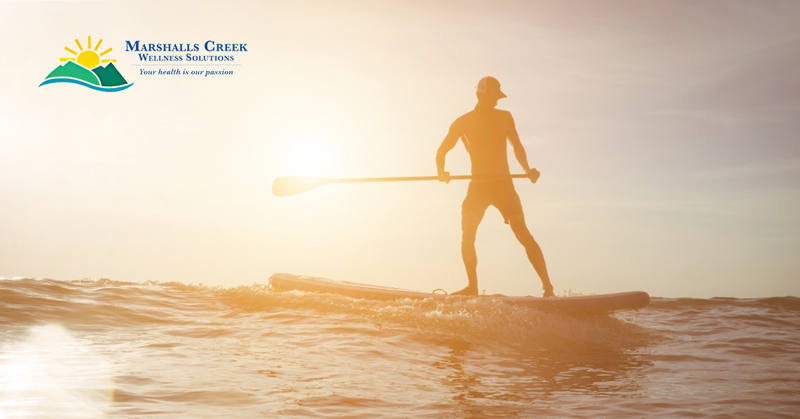 Go Paddle Boarding: Take a day trip to the ocean, or a weekend getaway to the lake and rent paddle boards. Paddle boarding encourages rotation and movement of the spine, while increasing stability. Kayaking: Not as good at balancing as you used to be? And Maybe you’d rather spend more time paddling and less time falling into the water? Look into renting kayaks – you can even get a two-person kayak to share with the kids. Outdoor Yoga: Many facilities offer outdoor yoga during the summer. Find a class that’s convenient for you, and get out early to watch the sunrise while connecting with nature. Go For A Bike Ride: The cold weather is gone and the sun is shining. Take the family out for a bike ride on one of our local trails. Riding bikes gets your heart rate up, while still being low impact on your joints. But don’t stop at just a ride: Bring a picnic and eat lunch in a local park! Try A New Hiking Trail: Not sure which to pick? Check out this list of all of our local hiking areas. Be sure to bust out the sunscreen and bug spray! Have A Water Fight: Whether you’re using squirt guns, balloons, or sponges (great for reducing waste), head out to the back yard and see who comes back soaked! Have A Dance Party: It’s about time the kids were introduced to all of your favorite hits from when you were their age. Play Capture The Flag: This is a great game to get the neighborhood involved in. Grab another family and play on teams. If you’re playing in the front yard, make sure to set up safety cones to warn drivers that there may be fun times happening in the street. Go Fishing: Take the kids fishing and learn how to clean a fish – then take it home and toss it on the grill. Plant a Garden: Summer is the perfect time to start gardening, even if you are only planting a few goodies. Check out this list of vegetables to plant during the summertime. Is Your Back Pain Stopping You From Having Fun In The Sun? Almost all of the activities listed above are low impact – unless you get really competitive at capture the flag. Low impact exercise is actually good for your back, even when you’ve had injuries or pain. Unless your doctor tells you otherwise, it is important to keep your back bending, rotating, and twisting. The summer is the perfect time to do this! And if you have any concerns about your back, contact Marshall Creek Wellness Solutions today for an evaluation!